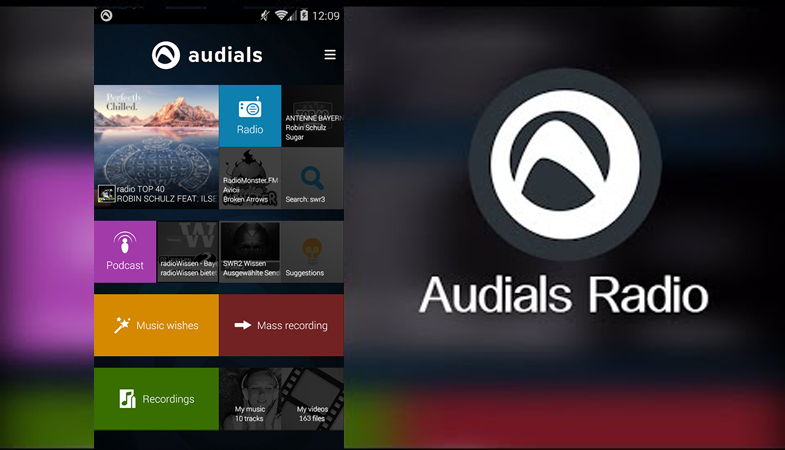 The Audials Radio app exists for Android, iOS as well as Windows devices. Is a music application that entertains you with nearly 100,000 online radios and allows you to record music in MP3, no matter where you are. The free app does not contain any advertising and has many bonus features that will surprise you. Not only the best international, national and even local stations are part of Audials Radio, but also more than 100,000 podcasts on various topics such as comedy, business, games etc. The radio stations are presented with the logo and show the artist being played as well as the song. If you have a favorite artist, you can also enter his name directly in the app, and all the stations that play songs of this musician will appear. Likewise, the record button can be pressed at any time while listening to a favorite radio station to automatically record all songs played back. The recordings are automatically provided with ID3 tags and album cover. When a song is played that you want to keep, just tap Record and the app will cut the music from the radio stream and save it to MP3 on your smartphone/tablet or directly in the cloud. The Audials Radio app is also one of the few that creates a wireless connection with AirPlay receivers or Chromecast to play music. In addition, there is a car mode, which allows an optimized visualization. So, you don’t have to abandon the application even in the car. Additional features are the sleep timer and the setting of the interface according to your preference lighter or darker.